Flag Systems is here to serve "All Your Flagging Needs". 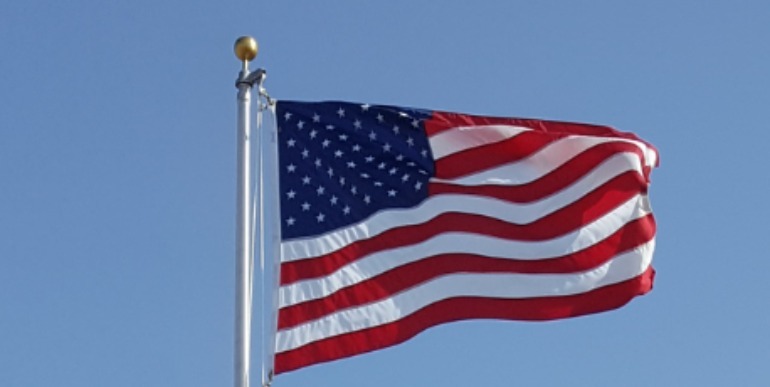 We make buying flags and flagpoles convenient for everyone in the Dallas Ft. Worth Area. Flagpole Installation and Sales is what we do best! New construction, remodel, home addition, whatever you need a flagpole for we have you covered. You can make your purchase at our store conveniently located off of Valley View ln. and 35E, you can call in your order or you can shop online by clicking here. To view our Flagpole Sales Page click here. We not only stock American & Texas Flags but we have Indoor Flags & Flagpoles, Law Enforcement Flags, Historical Flags, Military Flags, Religious Flags, Corporation Flags, Car Flags, Stick Flags, Framed Flags, Custom Flags, all 32 NFL teams & select MLB, NBA, NHL & NCAA Flags all in stock. We are open to the public on Monday to Friday 8 a.m. to 5 p.m. Come visit us at 2300 Valley View Ln. Ste. 109 Dallas TX 75234. You can click our address for directions to our Flag Store! 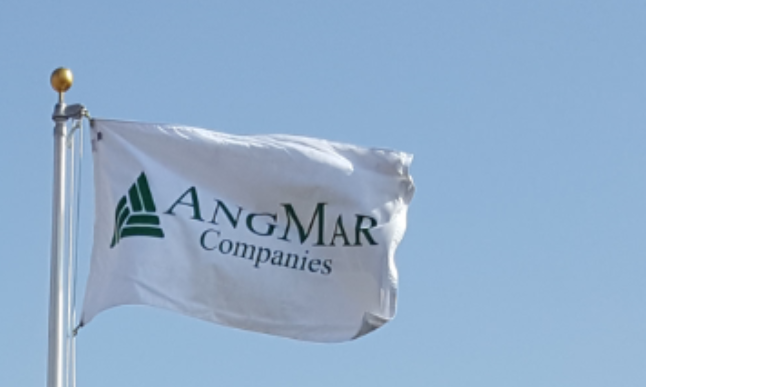 To get a free quote on flags click here. Our flag & flagpole sales staff is ready to assist you with your flagpole installation project. 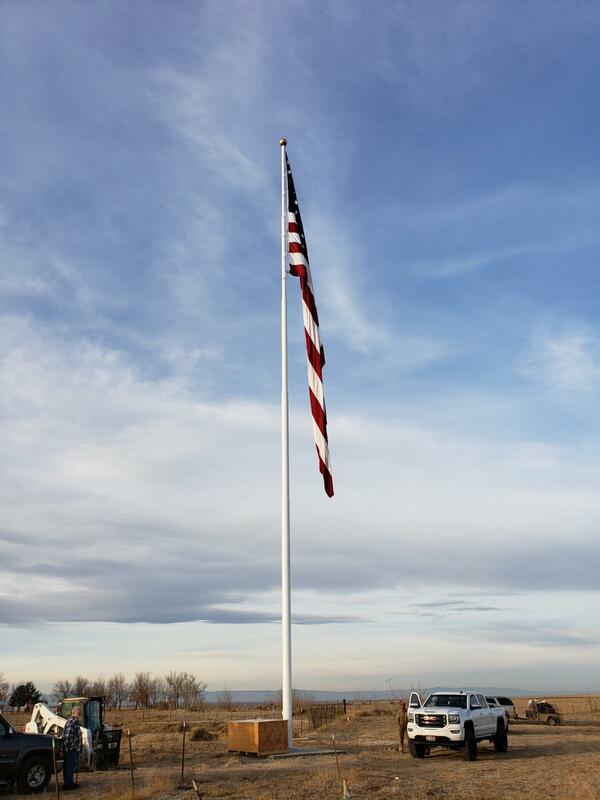 We have hundreds of flagpoles in stock ready to ship or be installed by the Flagpole Professionals at Flag Systems. Flagpoles come in many styles for different mounting applications. We sell a variety of flagpoles like Steel Flagpoles for Monster Flagpole Applications from 80' to 200'. Aluminum Flagpoles for Residential and Commercial Flagpole Applications ranging from 15' to 80'. We also offer Fiberglass Flagpoles which range from 20' to 72' and can also be used in Residential or Commercial flagpole applications. For help choosing the perfect flagpole click here! 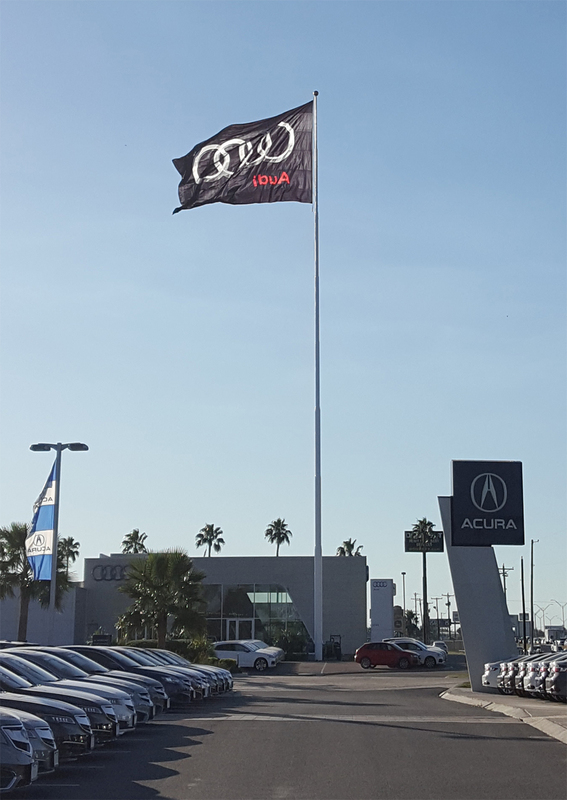 Flag Systems is your One Stop Shop for anything flag & flagpole related. To request a quote for a flagpole or flagpole installation click here. No project is to simple or complex for Flag Systems. We are here to bring you only the best Flag & Flagpole products and services. Your satisfaction is our guarantee! And just to prove that we are now offering a limited lifetime warranty on all of our flagpole shafts in addition to the 1 year warranty we already offer on parts and flagpole installation's. 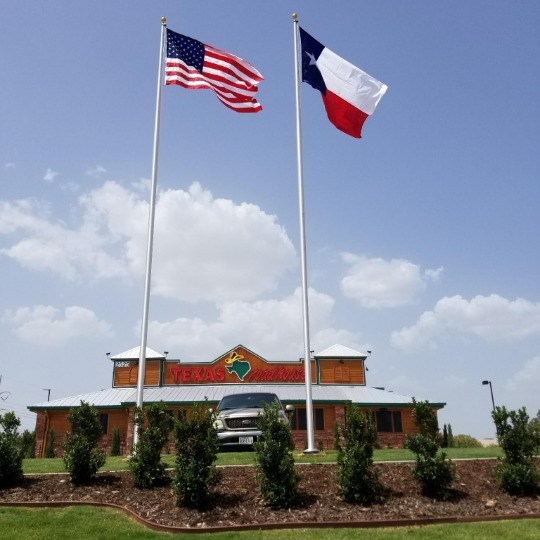 Flag Systems is your one stop shop retailer and flagpole service provider for flags and flagpoles in Texas. 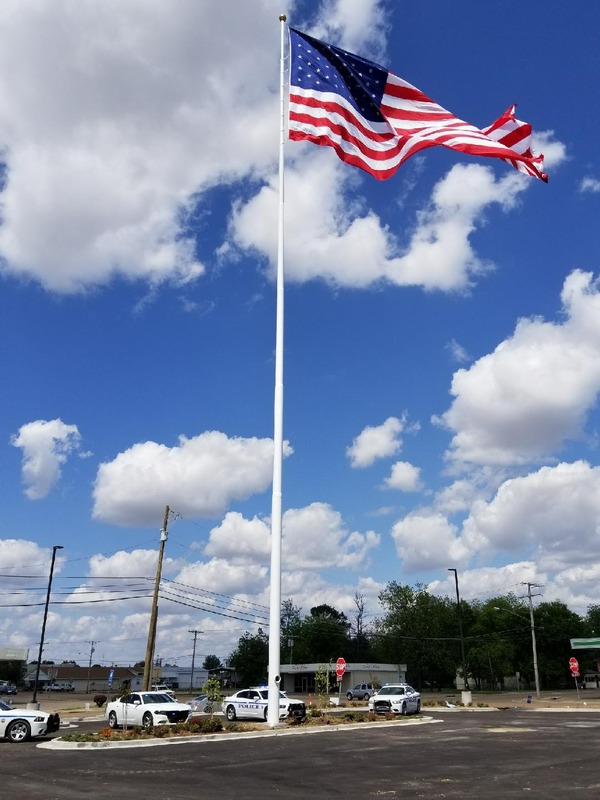 We offer Flag & Flagpole Sales & Service at an affordable price for everyone with same day flag or flagpole delivery(in town)/shipping; flagpole purchase, flagpole installation, flagpole repair, flagpole removal, flagpole relocation, flagpole renovation or any flagpole service in the Dallas/Ft.Worth area. Contact Flag Systems today and let us take that headache away. To request a free quote on any of our flagpole services click here. Flagpole Installation can be a tricky process that is better left to the professionals. 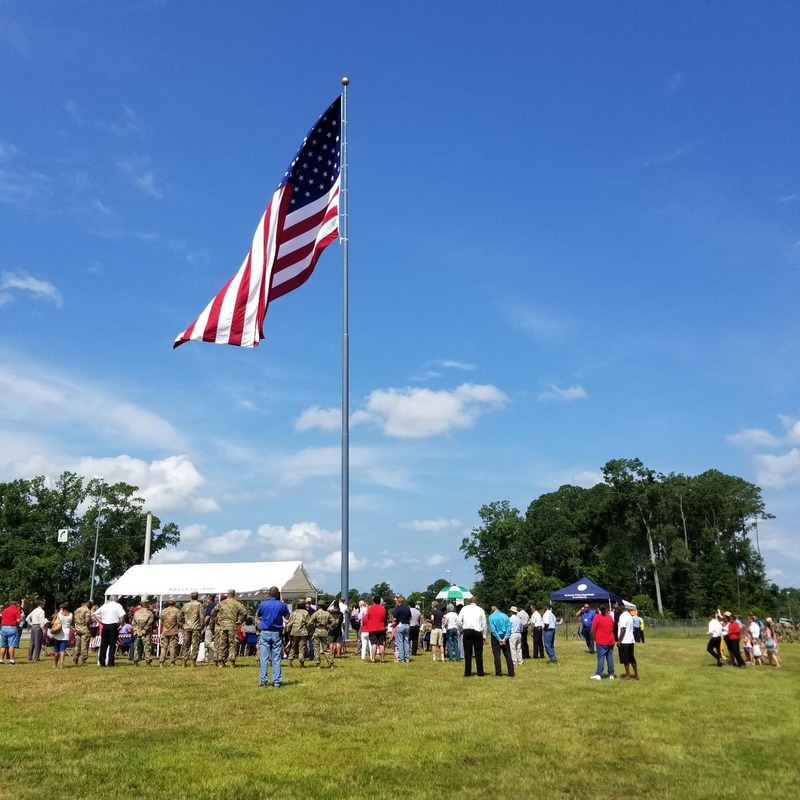 Flag Systems is your leading provider for Flag and Flagpole Service and Sales, we offer an array of services that we guarantee will meet any of your flagging needs. 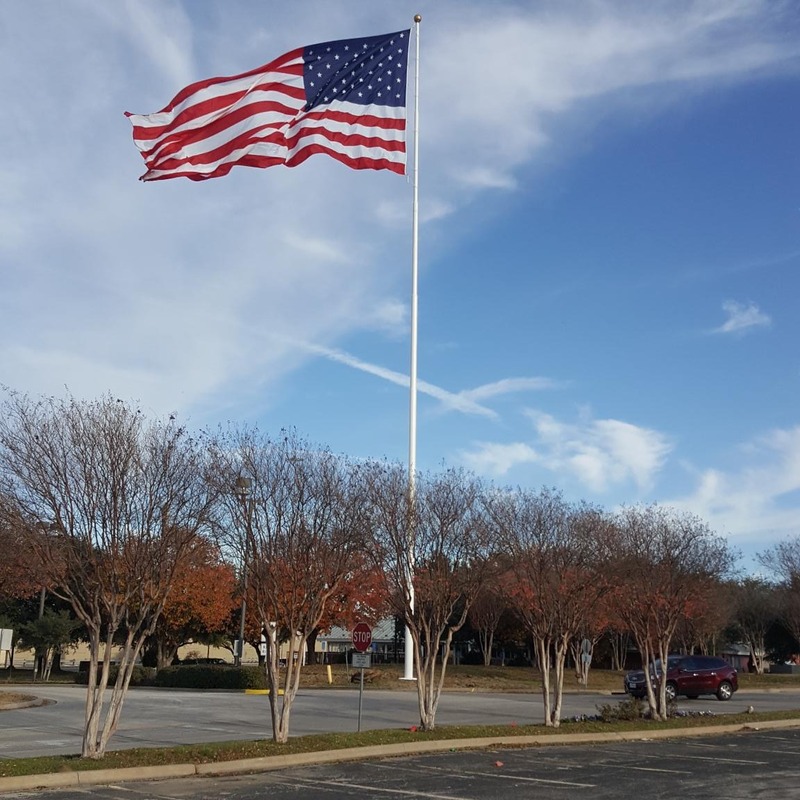 We have over 25 combined years of experience & knowledge in the Flag & Flagpole Industry which makes us Dallas/Ft. Worth's preferred flagpole installation & flagpole repair company. We install flagpoles no matter how large or small they are. 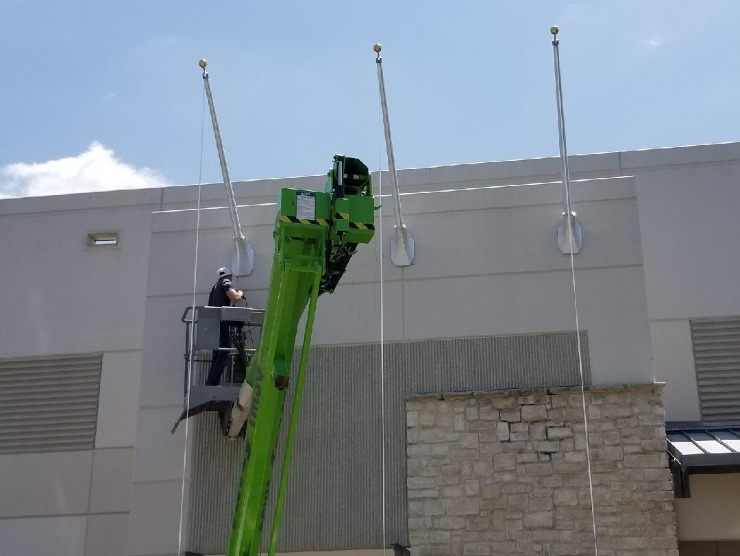 Flag Systems installs Steel Flagpoles, Aluminum Flagpoles, Fiberglass Flagpoles, Wall Mount Flagpoles and Nautical Flagpoles. We repair and install flagpoles in Texas, Oklahoma, Arkansas, Louisiana & New Mexico. Look no further than Flag Systems, we take great pride in patriotism and we guarantee our work, every flagpole we install includes a standard 1 year warranty. Contact us for more information on our Extended Warranty Plans. When flagpoles are installed by un-trained individuals, problems like the ones shown above are twice as likely to happen. If a flagpoles foundation is installed improperly it can lead to expensive flagpole re-locations or ugly insurance claims. If the foundation is installed un-level it will cause the flagpole(s) to lean in their foundation. When there is not enough concrete to anchor the weight of the flagpole into the ground the wind load can cause cracking in the foundation ultimately leading to your flagpole leaning or even falling over. If flagpoles are Wall Mounted and do not have the correct depth, anchors, or placement; it will cause less stability in the overall integrity of the base. Flags on flagpoles that are improperly placed can become tattered prematurely due to its surroundings. 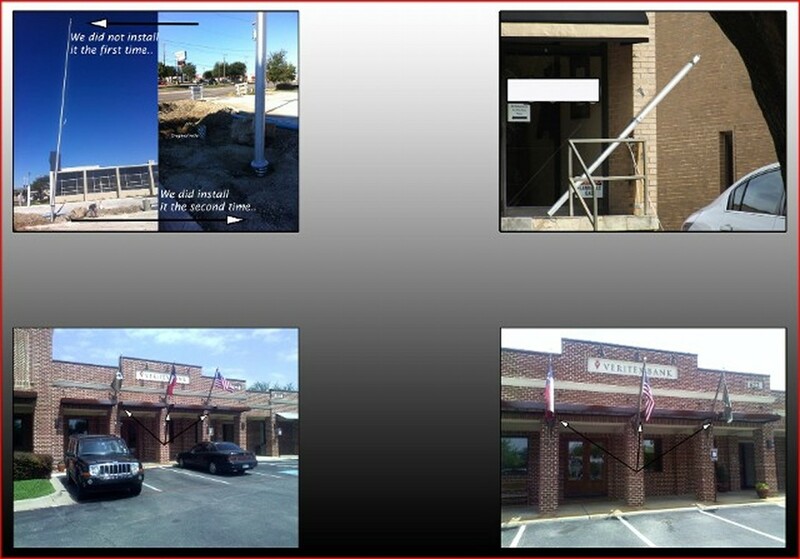 With over 25 years of combined experience Flag Systems is Texas's leading Flagpole Installation and Repair Company. Eliminate all the items on your patriotic to-do list by calling the experts at Flag Systems, we offer our services at cost effective prices. 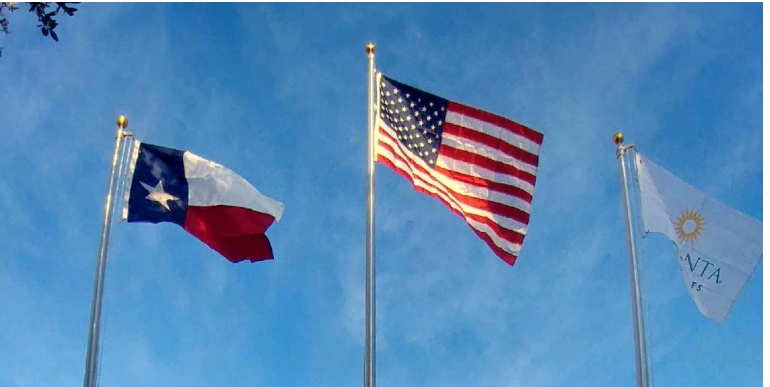 We are the leading supplier of flags, flagpoles and flagpole service in Texas. We'll be there whenever or wherever you need us! 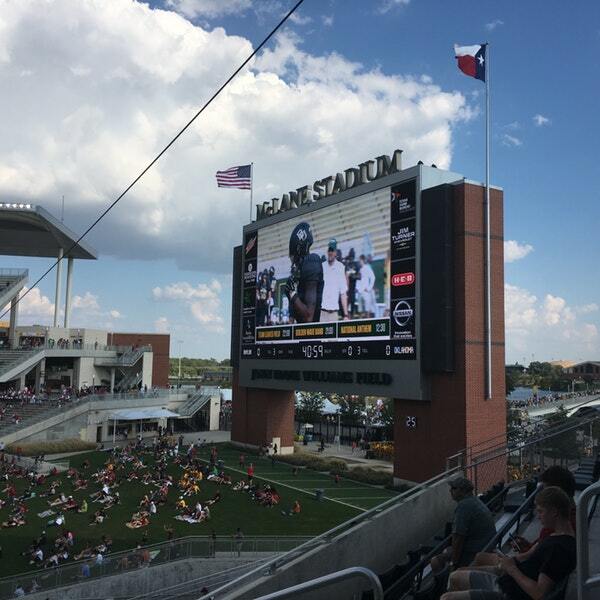 Flag Systems services the entire State of Texas, Arkansas, Oklahoma, Louisiana and New Mexico. We service residential and commercial flagpole customers alike so call us today for your free estimate at 877-801-FLAG or click on our Request a Quote page, just fill out our short flagpole service form and we will be in contact with you that same day. No project is to big or to small so when you consider having a flagpole installed or purchasing a flagpole, give us a call. We will beat any competitors price! 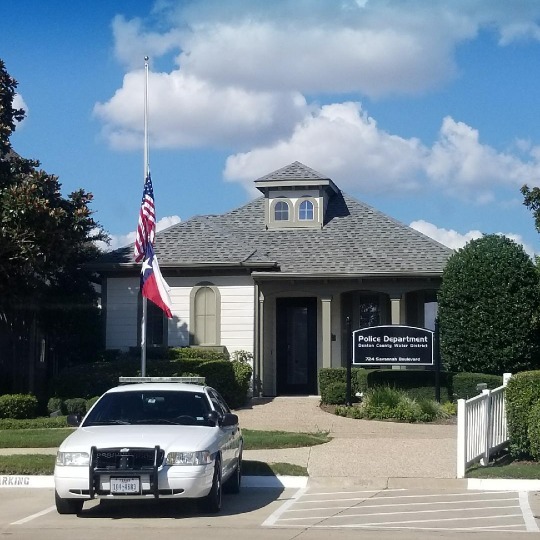 We offer Flag & Flagpole Sales, Flagpole Installation, Flagpole Relocation, Flagpole Removal and Flagpole Repair ANYWHERE in Texas like Dallas TX, Ft. Worth TX, Addison TX, Allen TX, McKinney TX, Bedford TX, Arlington TX, Grand Prairie TX, Coppell TX, Denton TX, Grapevine TX, Hurst TX, Southlake TX, Rockwall TX, Terrell TX, Austin TX, Marble Falls TX, San Antonio TX, Laredo TX, Victoria TX, Houston TX, Conroe TX, Galveston TX, South Padre Island TX, Lubbock TX, Amarillo TX, Corpus Christi TX, Laredo TX, McAllen TX, San Juan TX, Midland TX, Odessa TX, Abilene TX, Sweetwater TX, Tyler TX, Marshall TX, Longview TX, Canton TX, Texarkana TX, Wichita Falls TX, El Paso TX, Kermit TX, and many more. 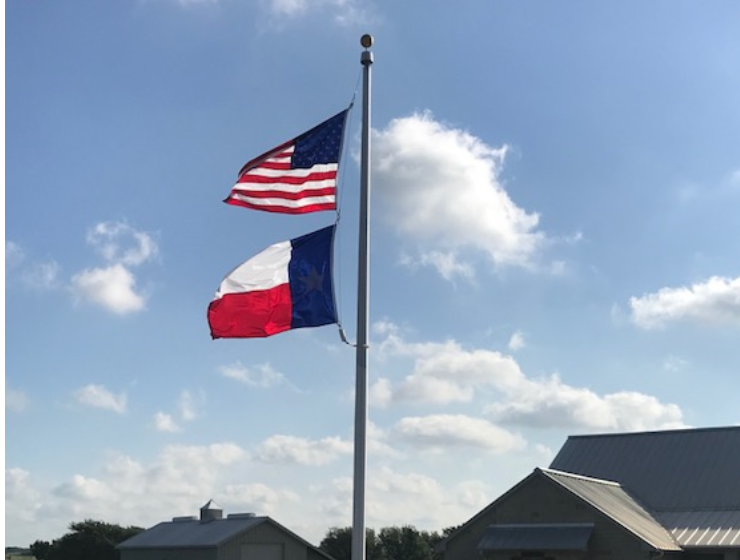 If you do not see your city on here don’t worry, we did not list all the cities in Texas because there are just too darn many to list but rest assured we offer all of our flagpole services to your Texas town! This is a short time lapse video of our field team installing a 50' flagpole that will begin its service as a camera pole. 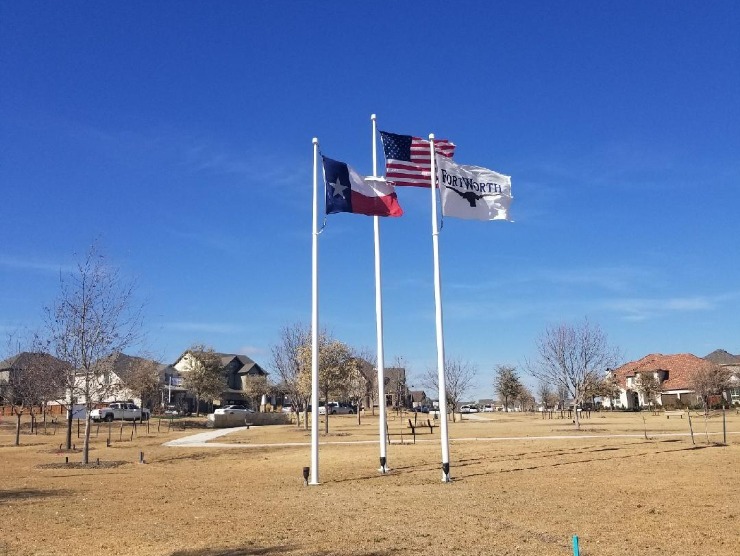 Our field team is the best in the business, when you hire Flag Systems to supply and install your flagpole you can be rest assured that your installation will be done properly. ﻿This is just a short video of a turnkey flagpole package one of our customers bought recently. The flags and flagpoles came out great! They really compliment the building and sign behind them.. If you are looking for something similar give us a call. Our turnkey flagpole packages start at 20'/25' and go all the way to 75'/80'. To view pricing and options click here. ﻿﻿You can see how the rock in this video jerks and shakes the drill rig. Rock drilling is no joke and when you install a flagpole foundation into the bedrock you can be rest assured there is nothing that will move or torque that foundation out of it's place. When your trying to install a flagpole in a seemingly tricky position or placement that doesn't quite look right call Flag Systems. We specialize in flagpole installation and can make your flagpole idea's a reality even in the toughest conditions. ﻿Here is a 20'X38' flag being raised on an 80' Independence Series flagpole. 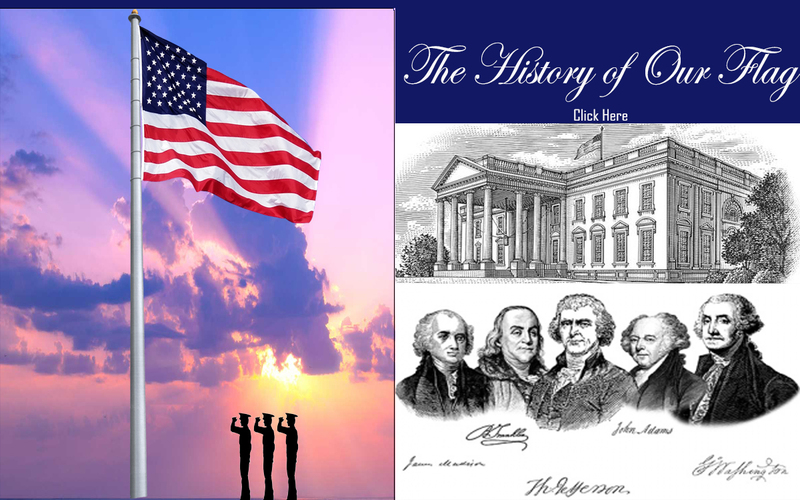 Our Independence Series flagpoles are the "Cadillac" of flagpoles. They are an internal steel cable based flagpole meaning they have the most durability and lowest up-keep out of all our flagpole series. Our aluminum winch handle and stainless steel gear-less flagpole winch make raising and lowering the flag a breeze. 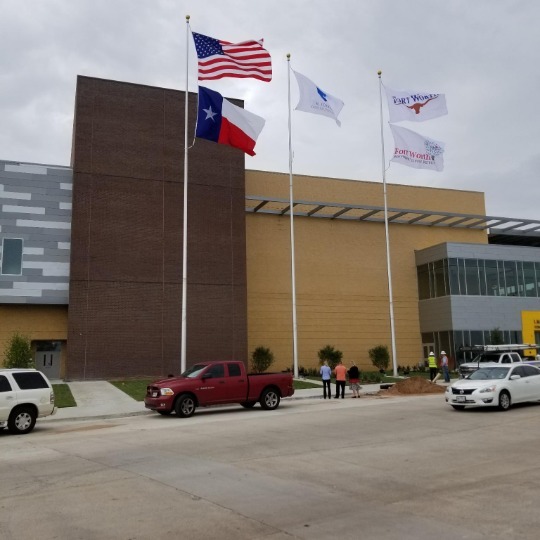 IM Terrell Academy had a beautiful flagpole setup installed over the summer to bring in their brand new auditorium. An 80' flagpole really makes a statement but when you have an 80' and two 75' flagpoles you are guaranteed to get some attention! Call us today and plan your next big flagpole project!